You’re invited to join the Alzheimer's Association International Society to Advance Alzheimer's Research and Treatment (ISTAART). ISTAART is a professional society for scientists, physicians and others involved in the causes and treatments of Alzheimer's disease and other dementias. Members enjoy a variety of benefits including opportunities to engage in exclusive networking and research discussions. Non-members: There are two ways to join ISTAART. Join today via ISTAART’s website. 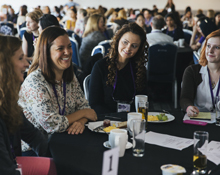 Select ISTAART Membership + AAIC Registration during AAIC registration to add ISTAART membership to your conference fees. You will receive full AAIC conference admittance and all of the benefits available to ISTAART members, both during AAIC and for the following year through June 30, 2020. Early access to online registration and preferred hotels. Discounted fees for preconferences, workshops, conference recordings and continuing education. 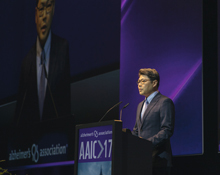 Exclusive access to Professional Interest Area (PIA) Day at AAIC (Saturday, July 13). Opportunities to apply for exclusive awards. Access to member-only receptions and workshops. Extended deadline for abstract submissions. Online subscription to Alzheimer's & Dementia: The Journal of the Alzheimer's Association. Online subscription to Neurobiology of Aging. Opportunity to join or create a Professional Interest Area (PIA). PIAs are assemblies of members with common subspecialties, including neuroimaging, neuropsychiatric syndromes, vascular cognitive disorders, biofluid-based biomarkers and 15 more. Extended LOI deadlines for the Alzheimer's Association International Research Grant Program. "Networking with colleagues with common goals can catapult progress forward—ISTAART’s Professional Interest Areas (PIAs) provide that opportunity for Alzheimer's disease at a global scale." – Roberta Diaz Brinton, Ph.D.
ISTAART is the nominating body for the Inge Grundke-Iqbal Award, which is presented to the senior author of the most impactful study published in Alzheimer's research over the preceding two years. The recipient will be invited to present their findings in a plenary session at AAIC. 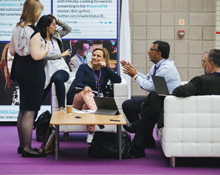 Some ISTAART Professional Interest Areas will host 90-minute sessions focused on research updates during PIA Day at AAIC (Saturday, July 13). Most of the sessions will be followed by the PIA's annual business meeting (although, some business meetings will take place throughout the week). Each 90-minute session is developed by PIA leaders (sessions will be held from 7:30 a.m. to 5:45 p.m.). PIA Day is open only to current or new ISTAART members—members may attend any of the PIA Day sessions or business meetings, regardless of PIA membership. Members attend for free and should indicate their interest during AAIC registration. In order to attend, non-members must join ISTAART during AAIC registration (select the bundled full conference and ISTAART membership category) or join today via ISTAART's web site. PIA business meetings are a great opportunity to receive updates on PIA activities, participate in critical conversations about issues affecting the field, engage in networking with peers from across the world and determine objectives for the upcoming membership year. Monday, July 15: 6 – 8 p.m. It's one of the most popular events at AAIC! Network with fellow ISTAART members while you enjoy hors d'oeuvres and refreshments. 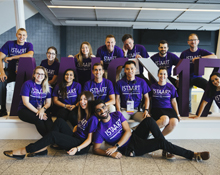 The International Society to Advance Alzheimer’s Research and Treatment (ISTAART) offers a Student Volunteer Program in conjunction with AAIC 2019. 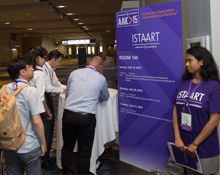 The program provides accepted ISTAART student members with the opportunity to travel to AAIC 2019. While daily volunteer efforts are an essential aspect of the program, participants are still able to fully acquire the latest scientific updates through attendance at sessions. Applications for the 2019 ISTAART Student Volunteer Program are now closed. For questions or information, email ISTAART@alz.org or call +1.312.335.5188. This expert series helps polish your professional skills and CV. Past topics have included grant writing, funding opportunities, manuscript tips and careers in science. Food is provided! The 2019 topics will be posted in the spring. Monday, July 15: 7 – 8:15 a.m. Engage with established investigators in a small group setting. This event is coordinated in conjunction with the Alliance of Women Alzheimer’s Researchers (AWARE) (PIA) through ISTAART. A RSVP link will be provided in the spring. For questions or information, email ISTAART@alz.org or phone 1.312.335.5188.